In this tutorial I’ll be going over a common technique used when building spell effects in games. I like to call them Soulercoasters, but you can name them whatever you like. The effect is a trail that flows along custom built mesh with flat uvs. Like a rollercoaster, you could say. This gives the look of a particle trail while having all the custom complexity of a mesh effect. This kind of effect is great for building weapon slashes, will o wisp style trails and much more. I personally love to use them to add extra detail to rune circles. To start we are going to need to create our mesh. If you look to the above example, you can see the kind of mesh I came up with. I will link a youtube tutorial on how to create a mesh similar to this below. To follow this guide I’m writing, all you will need is a stretched out poly plane. The important thing is to have the uvs flat and straight, like the example above. A poly plane will have this by default. But do make sure that the top of your plane is also in line with the top of your uvs! We want to scroll a texture along the mesh, not side to side. Once you have the mesh with flat UVs imported into Unreal, we can start on the material side of things. I will quickly explain the back end of what we will be doing on the uv side of things. 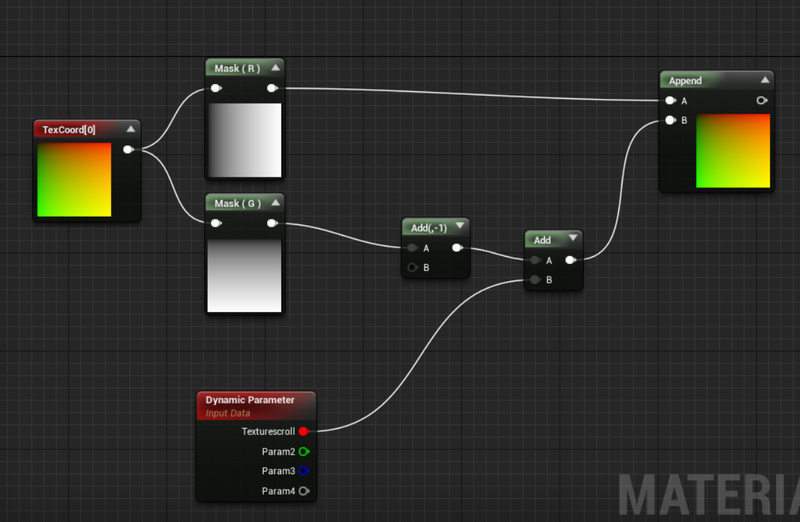 In the example above, I have made a quick diagram to give you an idea of how a texture behaves by default when panned. As you will notice, if you were to pan the texture up, down or to the sides, the texture will tile back onto itself. This is great for tiled textures and the like, but not so useful for what we are trying to create. As you see in the example above, once the trail has finished its loop along the mesh, it is already starting to wrap back around. This is not so good for weapon slashes and one off effects. 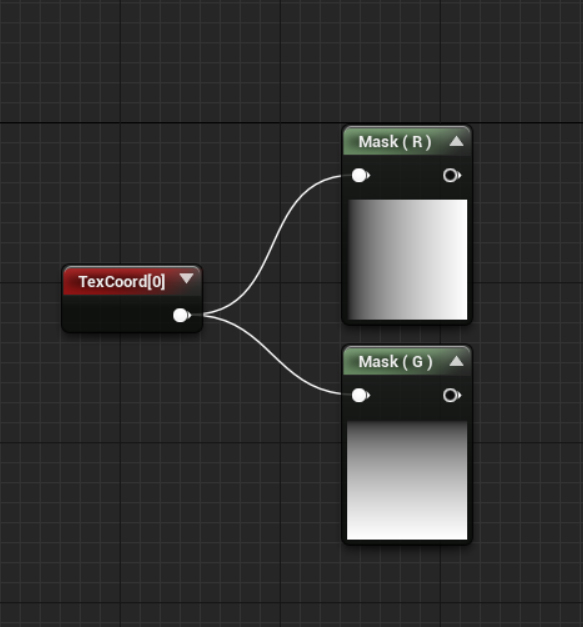 First we need to create a texture coordinate and two component masks. We will be using the component mask to separate the X and Y axis from our coordinates. This is so we can independently offset the coordinates on just one axis (Y axis in this case). Now we have separated our texture coordinates out into the x and y channel. 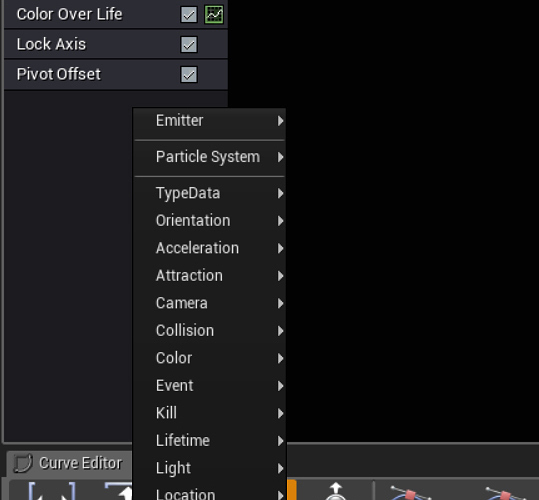 We can build a simple system using a dynamic parameter to offset then scroll our texture over the particles lifetime. All you need to do is add -1 to your G channel (Y axis). 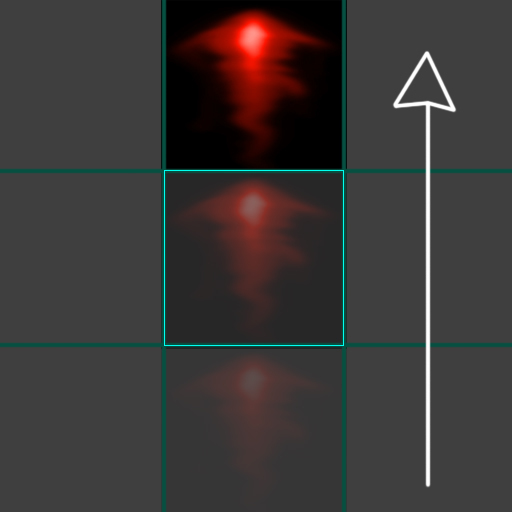 This will shift your clamped texture below the center frame like the examples I showed above. Next we need to combine our dynamic parameter with the output of our last add node, using another add node. If you have read my last tutorial, you will remember add is for offsetting coordinates and multiply is for scrunching. Lastly, we need to rejoin our two coordinates back together so we can plug them into a texture coordinate. To do this, create an append node and plug the final outputs of each of our split channels into it. You now have a two channel uv coordinate again. 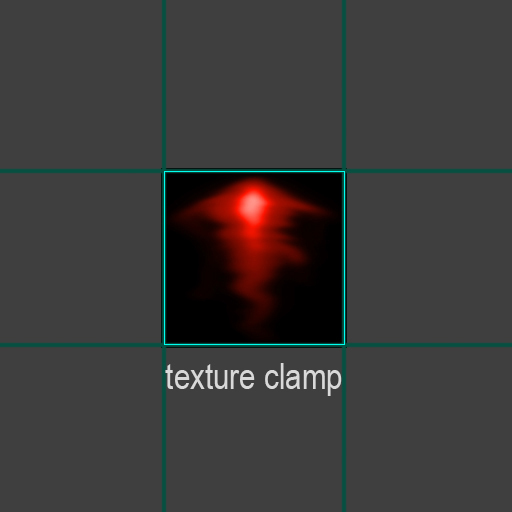 Now plug this into the back of your texture sample and plug the texture sample into emissive input. We are not done on the material end. Now to set up our clamped texture. Import your texture into Unreal. Once you have this imported, double click the texture in the content browser. You should see a menu that looks like the image above. Under the Texture menu, there should be double arrows pointing down on a drop down bar. This is to open the advanced options. Open it up and you will see x and y axis tiling method. Change these from wrap to clamp and save your texture. 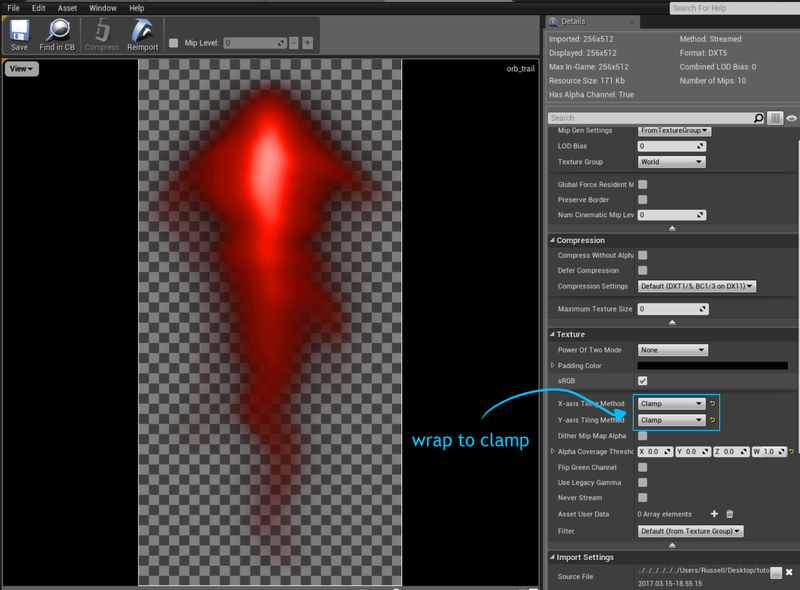 Create your mesh particle emitter and hook up the mesh you want to scroll the texture along. 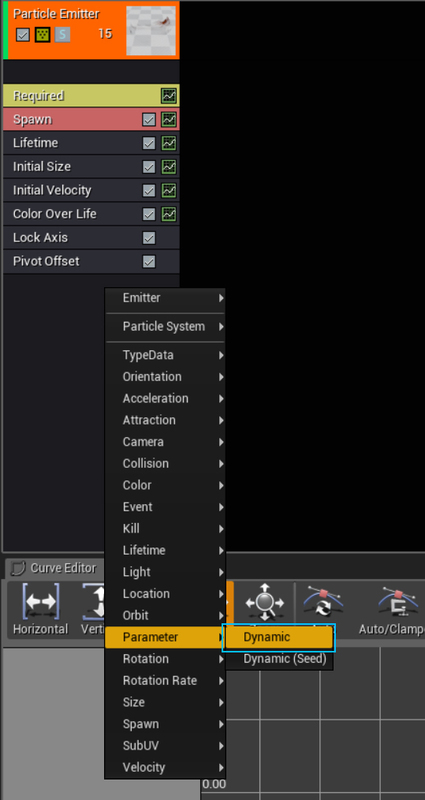 Next we need to add a dynamic parameter to our particle system. 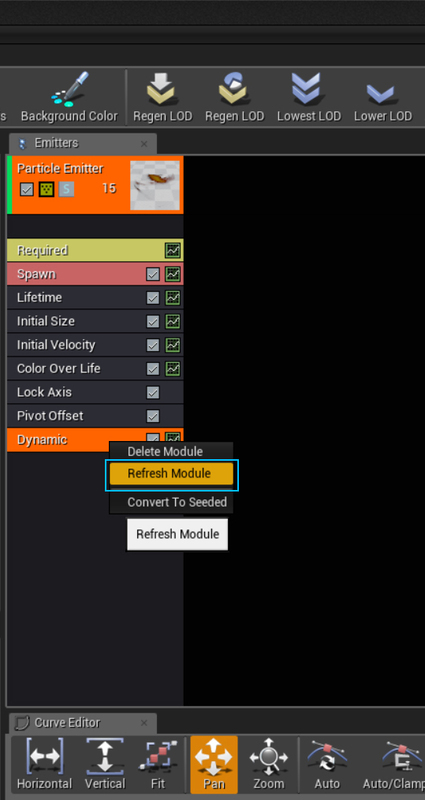 To do that, right click on your particle emitter drop down. 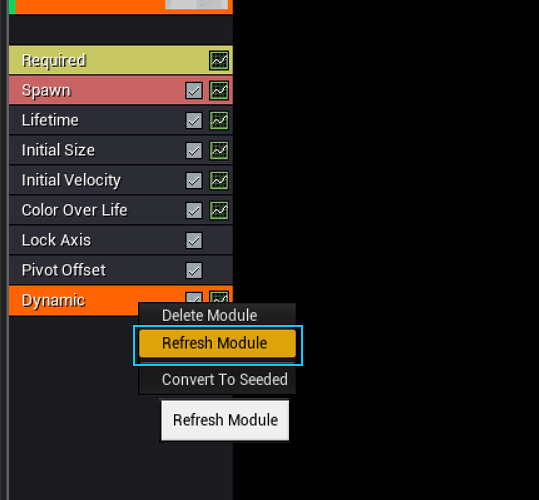 Navigate down to parameters and select Dynamic. Under “0” you will see whatever name you set as your dynamic parameters red channel and a bunch of other settings. We need to set our parameter to a constant curve under param value > distribution. Create two points on your curve and set the first in value to zero, and the other to one. Set the first out value to 0 and the second out value to two. What this is going to do is start our texture with an offset of minus one on the Y axis (remember the -1 add). As the particles spawn and follow their lifetime, we will be adding +offset to the textures Y axis. Shifting it up through the bottom of the uvs and out the top. If your texture has clean opacity at both the top and bottom, you should see your texture nicely pan along your mesh and out the top. And that is it! You can do all kinds of cool effects with these. Try building spirals and different crazy shaped meshes. Scale and squash them, spawn them on random angles and give them different lifetimes. The possibilities are almost endless! Below I will post my final material network to give you an idea of the kind of additions I like to stick in my trail mesh networks. These little tutorials are really cool - keep up the good work! Are you ever going to create a “spiral mesh” tutorial? I find that one difficult to produce. It’s like a fireball mixed with a corkscrew. It looks something like https://www.youtube.com/watch?v=Pa6FdHD1Cz0 (0:42). A spiral mesh would be great for a straight projectile (that collapses on one axis). Just like your souler-coasters are a great substitute for trails in certain places. Thanks! Threads like these sure make me wish we had a “Save as PDF” option, awesome write-up! Ill be writting up a few more soon. As for the trails on the fireball you linked. From the movement it has, its definatly a particle style trail rather than Geo. Trails go jaggy when fast yes, but if you make them dense enough, they can go smooth. Its just very expensive obviously. Also it appears in that video the user is using Popcorn Effects. I have not played with Popcorn a whole lot, so maybe there is a solution inside the tool! If however, you are making a straight projectile with a set velocity forwards. You can use this geo technique to creat the same kind of effect. Just dont make the trail geo too long. Otherwise you will have issues fading it out nicely when it impacts an object! Thanks Russell, this will help with my effect for the vfx challenge! I never knew exactly how to do it; only ever had a vague idea of it. Hey guys i need some help on this, when i extrude my planes edge and add the divisions like the video, the UV’s are all on top of one another rather than the image in this tutorial at the very start. 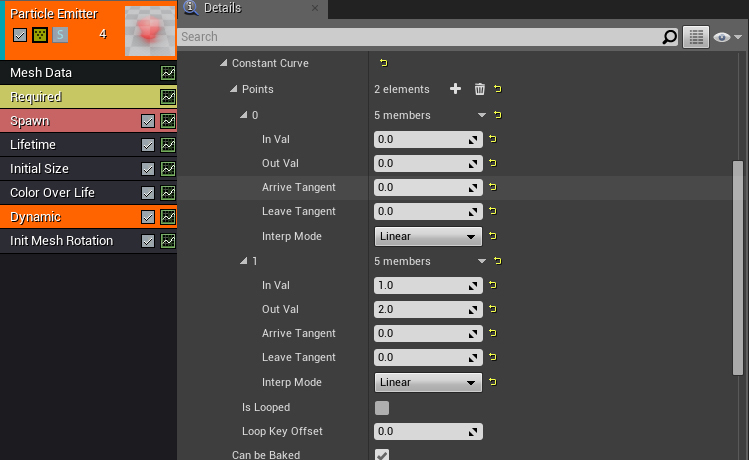 This means when i add a material in unreal it shows the panning texture on each and every face rather than rolling up the entire mesh, how did you get your uv’s to be like the above? thankyou! you need to layout your uv’s and then shrink them back down to fit in that 0-1 space. here’s a trick that i used in maya to do that. Thats great thank you so much that helped a tonne! I’ve got it working in engine now, going to try a few different shapes! just a quick one, i noticed you used a plane, when i use a plane and i create the effect, at certain angles you simply cannot see the material swirling around, is there a way around this or would it literally be making a cylinder instead of a plane? Are you not seeing the plane because you look at it from the backside ? You may need to enable double face in the software you use. Whenever I do these, I usually use a curved mesh (about 1/3 the roundness of a cylinder), and I make the material double sided. That way you can see it from different angles and you are cutting the polycount and overddraw of a full cylinder. thats a good idea, i have double sided turned on with the material but its hard to see from certain sides, so i will try this! Woah I just saw this. This seems very cool/useful and I’ll definetly give it a shot. I had been using vertex colors to fade out the edges. Which way do you think is better? Vertex colors or this? I assume the way you mentioned because you get more control over it? I’m sorry dude…but i can never forgive this portmanteau…you are dead to me. For anyone still passing through that may be getting stuck, here’s a quick list of what to do that will hopefully further clarify what to do. 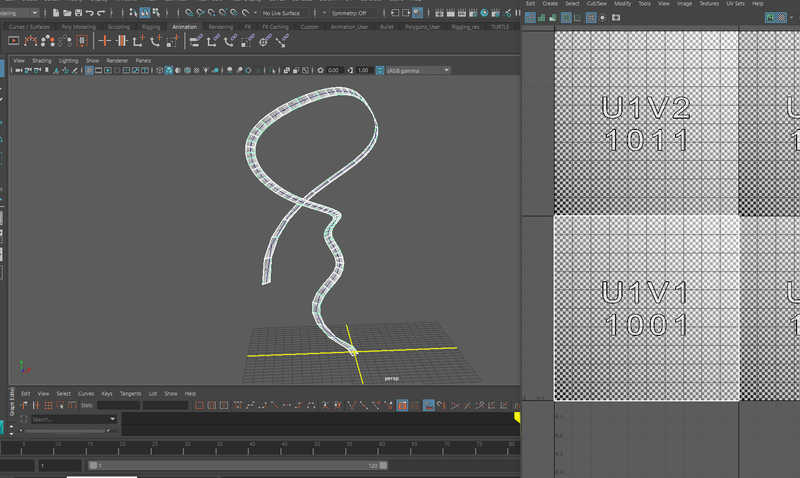 I wrote a tool for Maya to aide in creating these types of trails off of animated objects. You can use a regular transform or multi select vertices, etc. Pretty fun script. Allows for pretty extensive tweaking of the curves based on their thickness over length as well as rotation around the curve spine. 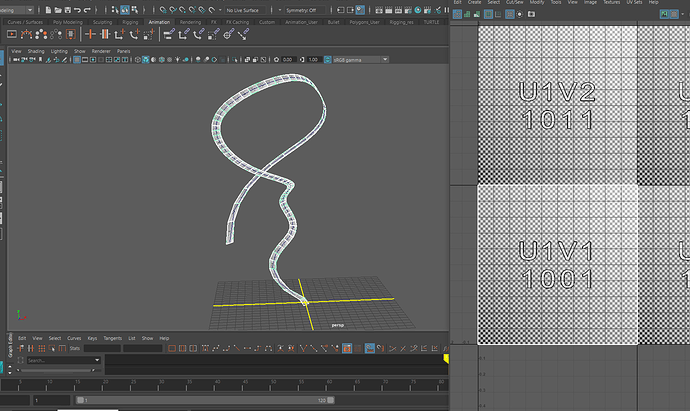 Also handles the UV layout of the trails. Bonus as well, you can optionally tell it to create perpendicular trails.